Do you have a local source for maple syrup, or do you buy it from the store? What is a good price for pumpkins? Can I bake with those big pumpkins or do I have to use the tiny, high-priced pie pumpkins? Do you have more pumpkin/squash recipes? Stay tuned! The first week of November is devoted entirely to pumpkin and squash! We have some wonderful recipes (both savory and sweet) and several great cookbooks to recommend. What type of roast should I buy? And how do I keep it from getting dry? How do you get your kids to eat different foods? - You cannot complain about food without trying it. - You try a bite of everything (usually they have to eat the number of bites they are old). - There is only one meal prepared so generally everyone eats the same food (there are a few exceptions to this rule). Have either of you made fruit leather? I (Alaina) also wanted to give you another very simple way to use butternut squash since that was the market fresh vegetable of the week. My mom suggested it, I made it, and the kids and I had it for lunch one day this week. One of my sons had three helpings - I call that a success. 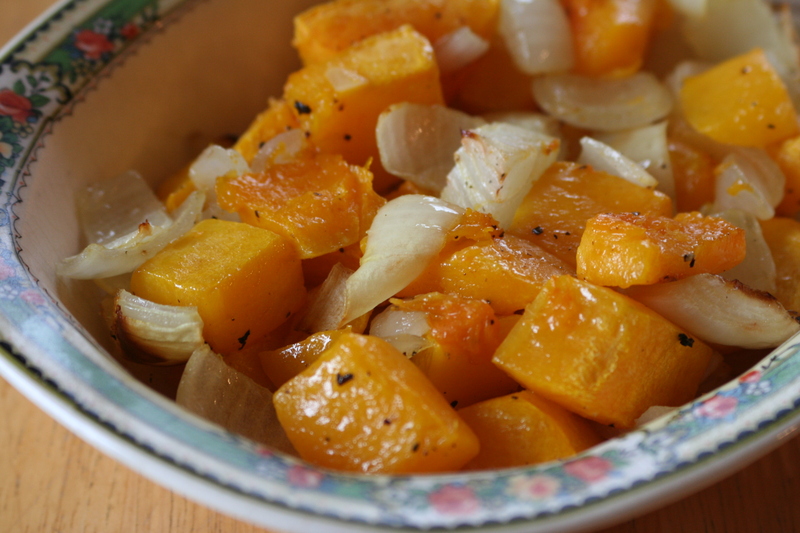 Toss squash and onion with oil, salt and pepper. Bake at 350 degrees for 45 minutes or until squash and onions are tender (the onions will be much sweeter than they are raw!). Makes a great and easy side dish.